In many ways, butter is unique in the world of fat. It doesn’t require us to kill the animal in order to obtain it, and without us it wouldn’t exist. The fat content of butter ranges from 80% to 86%, and the rest is water and milk solids. This means that butter isn’t pure fat; rather, it is an emulsion. 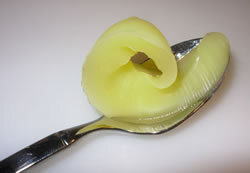 As a result, butter must be handled with more care than other fats in the kitchen. Warm butter can be chilled again, but if the butter gets too hot the emulsion will break and chilling will not bring it back. The milk solids in butter’s emulsion burn at the relatively low temperature of 250°F/121°C, so butter is not as useful for cooking at high temperatures. To use butter at higher temperatures it must be clarified. This simply means melting the butter over low heat until it separates into butterfat and milk. The butterfat, or clarified butter is poured off, leaving the milk solids behind. However, much of butter’s distinctive flavor is in the milk solids, so clarified butter doesn’t have the same taste as melted butter. Butter marries perfectly with sugar and is an undisputed star in the dessert kitchen. It adds lots of flavor, making tasty cookies, crisp pie shells, and light, flaky puff pastry. Many dessert recipes, such as butter cookies, rely entirely on butter for their taste. High fat butters give the richest taste and their lower water content produces the best results. 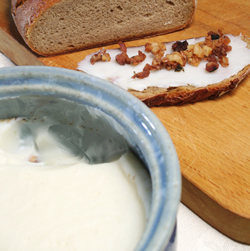 While the choice between cultured or sweet butter is personal, unsalted butter is often preferred for cooking because the amount of salt can be controlled. Which fat to use when? Animal fats are excellent for cooking because their low polyunsaturated fatty acid content makes them stable when heated and slower to oxidize. So the question becomes: which fat to use when? Your choice may depend on availability and many fat are interchangeable. When cooking meats, it is a good idea to cook beef in beef fat and poultry in poultry fat to reinforce the flavor. Pork fat or lard is the most neutral flavored fat. 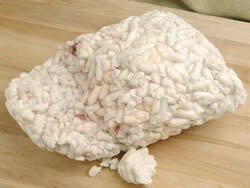 Lard, with its high smoke point 400°F/200°C is good for deep and shallow frying. It gives a crisp texture and its neutral flavor makes it ideal for everything from French fries and fish to doughnuts and fritters. Lard, especially leaf lard (rendered from kidney fat) makes a very flaky pastry but because it adds little flavor it is often combined with butter. Beef fat/Tallow/Suet has a high smoke point 400°F/200°C, and a rich subtle beef flavor that combines well with potatoes and is ideal for deep-frying and sautéing. It adds another layer of flavor when sautéing beef or vegetables. Beef fat also adds richness to savory pie pastry. Suet (kidney fat), with its milder flavor can be used in sweet preparations as well. Suet’s firmness results in very light dumplings and pastries and doesn’t need to be rendered – just finely grated. Poultry fats have a slightly lower smoke point at 375°F/180°, making them better for shallow frying. These fats add richness rather than distinctive taste, and duck and goose fats are the first choice for making confit. Poultry fat can be used for pastry making, but must be well chilled because of their lower saturated fat content.